Glance around a room full of entrepreneurs and everywhere you look you’ll see a saboteur. That’s because all entrepreneurs, no matter how kind-spirited and well-meaning, engage in various forms of self-sabotage that hold them back from reaching new heights in business. The entrepreneurs who recognize where they’re making those missteps and change their ways, are the ones who continuously reach their goals and go on to set and achieve bigger ones. The road to entrepreneurial success is hard enough. Stop adding your own twists, turns, and obstacles to your path by engaging in these five forms of self-sabotage, so you can go on to achieve your own vision of success. When you let your day happen to you instead of taking control of it, everything becomes a fire in need of putting out. You spend your time jumping from one request of your time to the next and switchtasking from one project to another haphazardly. This reactive mode results in wasted time and little movement forward. It is hard to slay your goals when you’re busy putting out fires. It’s necessary to implement specific strategies to be proactively in control of your time. That is where the real magic can happen in your business because you can allot more time for your high-value activities. Instead of perpetually reacting to your day and having to operate in firefighter mode all the time, plan your day the night before. Then, you wake up with an action plan and know exactly what you need to accomplish which enables you to get right to work on your highest priorities immediately. Use the 5 Daily Planning Pavers each night to help you devise a strategy to conquer each day consistently. Even though no day will go perfectly as planned, it will go far better than if you were to just fly by the seat of your pants. You will also accomplish a great deal more. Creating a plan gives you a goal to aim for, just as a bullseye does in a dart game. You might not hit your mark spot on, but with the right skills, you’ll wind up pretty close. Create a success schedule by utilizing time blocking and routines designed to maximize your productivity. Block out time on your calendar to work on your most important tasks and projects to ensure they get tackled. Layer productive habits one after another to form winning morning and evening routines. The rest of your day could go to the crapper but at least you’ll have moved your business forward with your productive routines. Revamp your routines as needed when you have a life event occur such as a sickness, vacation, new assistant, massive new undertaking, or the kids go back to school. A good routine will always be in alignment with your current goals. Checking email is another way you might be reacting to your day instead of proactively approaching it. If you are in and out of your emails all day, scanning through their subject lines and cherry picking which ones to open and respond to, you are being anything but efficient. Instead of checking your emails and living in your inbox, process your emails! Successful processing involves making a decision upon opening each and every email and it works to maintain control of your inbox! Being busy and hustling non-stop is not the way to success. Until you get big enough to the point you can replicate yourself in the form of hiring more people, you are your entire business. Don’t risk burnout. Just as they tell you to put your own oxygen mask on before helping others on flights, you must take care of yourself or you will never be able to take proper care of your business and manage it successfully. Just as a car needs fuel, you need to nurture yourself. You can’t constantly be operating on low. You will eventually run out of gas. Start practicing guilt-free self-care to nourish your mind, body, and soul. Make sleep a priority. When you don’t get enough sleep, it affects your ability to think, energy, and mood which all affect your productivity. Commit to getting enough sleep each night, which is seven to nine hours for most people. That might mean eating dinner earlier, not drinking caffeine after 5pm, and turning off screens by 8pm, but it’s worth it! Eat healthy, energizing meals and snacks loaded with vitamins, nutrients, and anti-oxidants. Exercise frequently to obtain good, mood-inducing endorphins while taking care of your body. Schedule breaks and actually take them. Enough already with working hours upon hours without a break. It’s unproductive! It’s difficult for anyone to stay focused for a long period of time. Take occasional breaks to relax and refuel so you can return to your work with renewed focus and motivation. It doesn’t matter how much money you’re bringing home if you’re too exhausted to enjoy the things you love when you’re off. Whether it’s basketball, painting, building houses, or doing puzzles, schedule time for your hobbies and passions. Also make sure you spend ample time with the people who make life worth living – the ones who love you for you, support you, and whose company you enjoy. Choose to work to live not live to work and you will be more fulfilled. No one says they wished they had worked more on their death bed. No one. 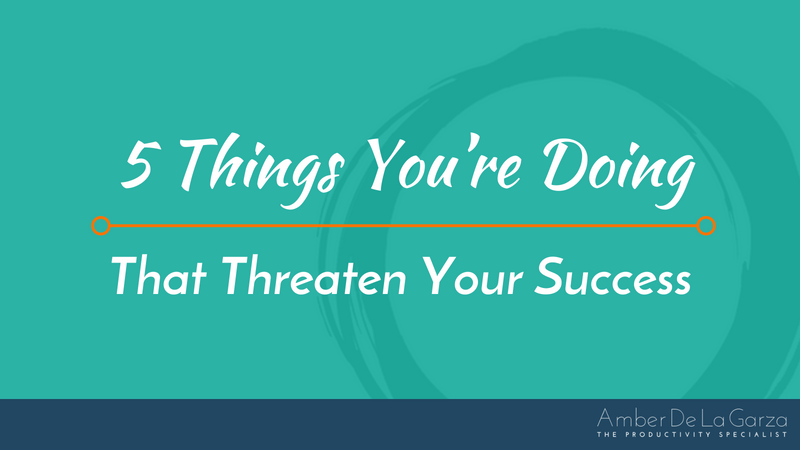 Even just thinking you can get it all done is self-defeating because you never will, which means you’ll never feel accomplished at the end of the day. And when you don’t feel accomplished, you fail to build the momentum necessary to continue making strides in your business. When you maintain the mindset that you can get it all done, it doesn’t force you to prioritize either. You then wind up working according to how you feel which breeds disorganization, being overwhelmed, and having to put out fires left and right. Coming to terms with the reality that you can’t get it all done empowers you! It forces you to prioritize and work on your high-value activities first. Otherwise, the important stuff keeps getting rolled over time and again. The day you do get it all done is the day you’ll be out of business because it means you don’t have another project or idea in the wings ready to take flight. Once you get to a certain level, one brain, two hands, and one mouth will simply not be sufficient if you want to continue growing your business. You could be ambitious, an expert in your field, and supremely productive, but at some point you will have to reach out for help, otherwise you’ll stay put on a plateau of business as is. The most obvious places to look for support are your dream team, your special advisory council, and your posse. Your dream team is made up of your employees and the contract workers you hire for repetitive tasks and special projects consistently such as graphic design, website development, content writing, podcast production, and taxes. Strategically delegate both skilled and unskilled tasks to your dream team to free up your time for the important tasks only you can complete. Turn to your special advisory council when you need a different perspective, advice, help dealing with a challenge, have a question in your business, or are facing a mindset block. These professionals are only a phone call away and may include your coach, mentor, peers, mindset group, or local association members. Your posse is made up of the people in your inner circle – your close family and friends, personal assistant, nanny, daycare providers, housekeeper, etc. These people are not necessarily business owners but they can play a huge role in supporting you, so you can run your business successfully. You might be surprised how well your kids or significant other can wash dishes, fold laundry, cook dinner, staple documents, run errands, and make copies. Also, lean on you friends who can help you out in a bind, join you for that needed drink, provide much needed laughs, and let you unload your frustrations without judgement. The support you need to show up as your best self in your business is all around you. Reach for your lifelines and stop trying to go it all alone! It’s good to do research and know who’s servicing clients in your market, but once you shift to actually comparing yourself, you’re competing in a game you can’t win. It’s not a game of comparing apples to apples. You’re comparing their shiny, bright, perfectly waxed oranges to your own dirty and bruised apples. That’s because you know the rocky path you hiked to get to this point intimately. You know all the bumps and bruises you endured. You can even feel some of their lasting, painful effects to this day. You can’t possibly know someone else’s full story and how they got to the pedestal you’re currently viewing them on. Your competitors may boast sun-kissed oranges everyone wants to buy today, but they likely didn’t start that way and had their own share of tough obstacles to overcome on their entrepreneurial journey to success. If you possess a competitive drive that fuels you, strive to compete with yourself and grow in accordance with your own unique gifts. Track your own metrics. Take care to stay in your own lane and make do with the vehicle you’ve been leased. You could be driving an expensive BMW capable of taking you anywhere you want to go but if you fill it up with diesel gas meant for someone else’s truck, it won’t take you very far. Furthermore, if you were to walk a day in someone else’s shoes, you might find out they stink. Compare yourself to others and you’re only sabotaging your success. Take an audit of your business and your role in running it. If you discover you’re engaging in any of these self-sabotaging behaviors, hold yourself accountable and make the commitment to stop. They only hurt your business and threaten your success. You owe it to yourself, family, clients, and the world to show up as your best, most productive self.